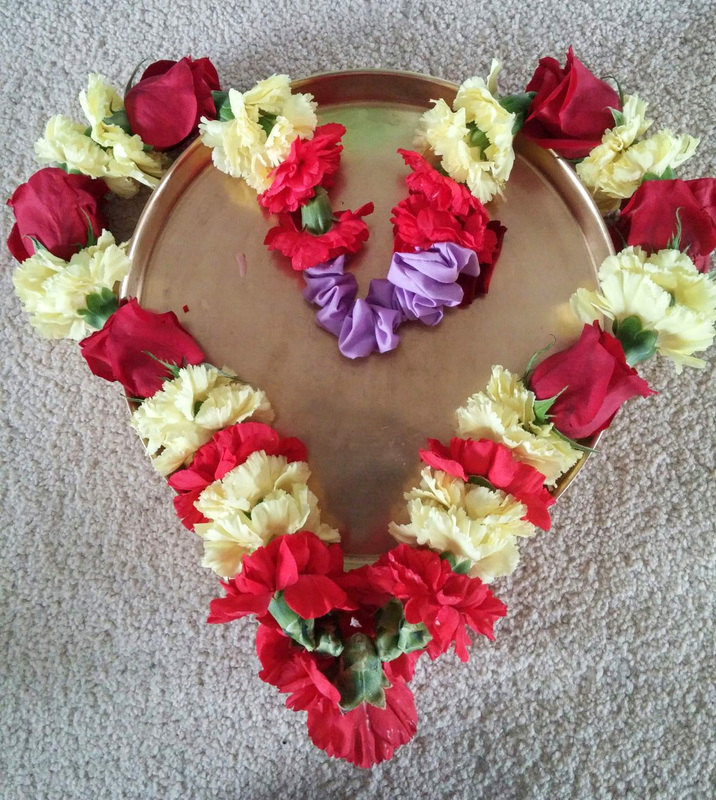 On Sunday, May 20 at 11:00 AM, about one hundred of Amma's devotees gathered in Georgetown for a special satsang with Dayamrita Chaitanya, one of Amma's senior monastic disciples. Dayamrita Chaitanya is the Executive Director of the MA Centers in the USA. He travels constantly, inspiring and counselling Amma's many satsang groups in North and South America. 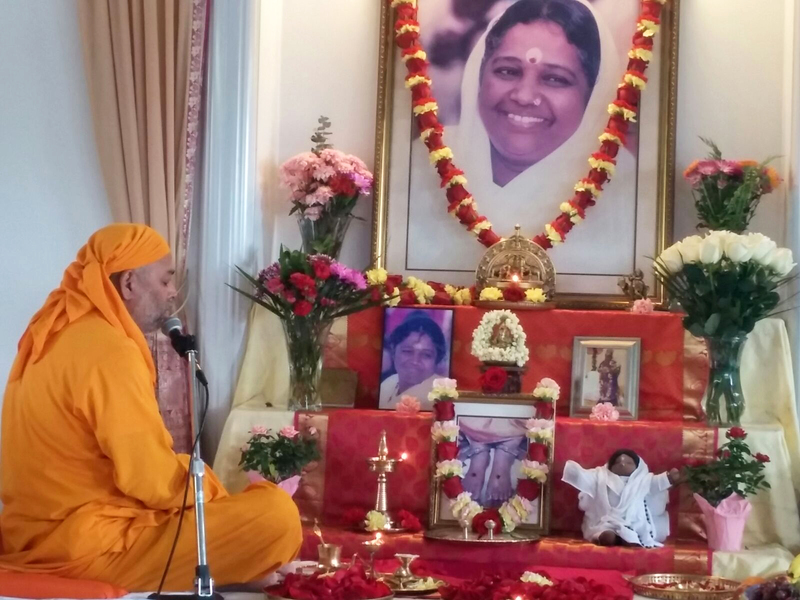 This visit marked ten years of Amma Satsangs in the Georgetown area. The celebration of this milestone gave the satsang the atmosphere of a family reunion, with many devotees savouring memories of the first Amma satsangs in the area ten years ago. Dayamrita Swamiji began the satsang with opening prayers from the Guru Gita. He then lead the group in Manasa Puja (guided meditation and visualization), chanting Amma's 108 Names (Archana), and silent meditation. After meditation, Dayamrita Chaitanya gave a talk highlighting the tenth anniversary, and Amma's upcoming visit to Toronto. Swamiji pointed out that Amma Satsang has continued here uninterrupted for the past ten years because of the sacrifice and service of the devotees. The motto on the emblem of Amma's ashrams is 'Tyagenaike Amritatwam Anasuh', meaning 'By Renunciation Alone is Immortality Gained'. Indeed, the functioning of the entire world is supported by the selfless sacrifice of a few individuals. Amma is the supreme example of such a person. For decades, She has given up all of her time and physical comforts to serve and console all who come to Her, 24 hours a day, seven days a week. She has never taken a holiday in 40 years, and She puts no conditions on Her service to others. If Amma's coming to North America were conditional on the devotees doing a minimum amount of spiritual practice or selfless service, probably She would never come. Yet, out of Her compassion, Amma comes every year, like the Spring, bringing joy to all without conditions or distinctions. Amma's coming brings us enormous opportunities. First is the opportunity to be in the physical presence of the Guru. We need the help of a Guru to cross the ocean of Samsara (transmigration). We are incapable crossing this vast ocean on our own, with our limited resources, and our heavy burdens and cares weighing us down. The Guru is like an ocean liner that drops us a rope as we are floundering, and pulls us up into safety. Once we are with the Guru, we need not worry what route we are taking, when we will arrive at our destination, or how fast we are traveling. We can leave all that in the hands of the Guru. Our duty as a disciple is to follow the Guru’s instructions to the letter, with total faith, shraddha (attention) and self-surrender. The Guru will then take care of the rest. In Amma's physical presence, the opportunities for doing Sadhana (spiritual practice) are multiplied. When we go to a church or temple, we may pray for one or two hours. In Amma's presence, we happily sit for 24 hours listening to sacred music and mantras. When we chant the Thousand Names of Divine Mother alone, we get the benefit of chanting 1000 mantras. When we chant in a group, Amma says the effect is multiplied by the number of people chanting.Thus, if a group of 30 people chant the Thousand Names together, each person receives the benefit of chanting 30 000 mantras. Imagine the benefit of chanting the Thousand Names at Amma’s program when there are 1000 people or more. This is one way that being in the Guru's physical presence accelerates our spiritual development. Amma's coming also brings so many opportunities to do Seva or selfless service. Traditionally, when a new disciple entered an ashram, the Guru would not begin by telling them to meditate, or do headstand, or special breathing exercises. The disciple would begin by doing selfless service in the form of menial work without reward. Only action of this type removes the ego and purifies the mind. Very often while doing Seva, we encounter difficult experiences that bring up our inner resistances and limitations. If we are chopping vegetables, someone may come and tell us we are doing it all wrong, and show us the 'right' way to do it. We may become angry or frustrated, and feel like quitting. In these moments, we must realize that Amma is at work in this situation, chopping our ego! If we can surrender to Her teaching and continue, we will develop patience, and flexibility, and remove some of the impurities from our minds. Amma has created so many humanitarian and environmental initiatives. If She wanted these projects to achieve their goals with the greatest speed, Amma could have hired professionals to do them. Instead, Amma keeps all these projects volunteer-run, because She is thinking only of our spiritual development and evolution. Dayamrita Swamiji pointed out that when we are asked how has Amma touched our lives, it is hard to give an answer. There are almost no aspects of our lives that Amma has not touched, from the way we speak, to the way we act, to the way we think. Time and again, Amma has turned us away from useless social life, and has made our lives more beneficial to others. None of us would be together in this Satsang if it weren’t for Amma. This tenth anniversary is a time to reflect with gratitude on the continual acts of service and Grace that have kept the Toronto Satsang going up until now. It is also a moment to think on what each of us can do to make Amma Satsangs, and Amma's upcoming Toronto program be of maximum benefit to ourselves and all our fellow beings. The discourse thus concluded, Dayamrita Chaitanya led the group in singing Prema Prabhu Lasya, followed by Prabho Ganapate, and Om Sri Aho. Swamiji then beautifully sang Come Children, Katinnu Kataya, and Devadideva, concluding with Jai Jai Jai Durga Maharani. The satsang ended with closing prayers and Arati to Amma. Amma's Toronto children were filled with gratitude for Dayamrita Chaitanya's visit, and anticipation for Amma's upcoming return to Toronto.